Are you looking to upgrade your spa or wellness center chairs? 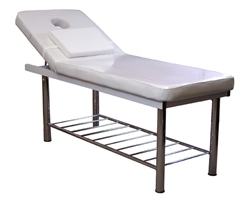 We have a new bed that is ideal for spas, salons, medical offices, wellness centers, and more! The Cosima 3-Motor Electric Spa & Wellness Chair features a clean, elegant European style with 3 silent motors for quick and convenient position adjustment. Positioning options provide both patient comfort and ease of access for those providing treatments. Shaped and very comfortable seat, durable and very stable. Armrests lift for ease of client entry and exit. Powered Height Adjustment: Range = 24" to 41.75"
Upgrade Your Room on a Budget for the New Year! Upgrade your massage or facial room on a budget! 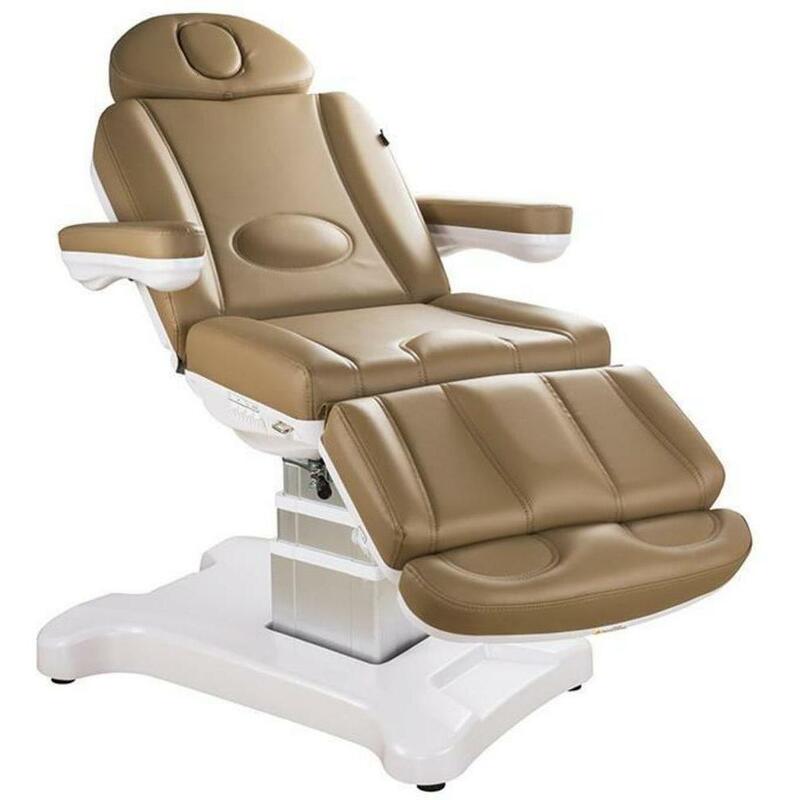 Pure Spa Direct recently added new electric and stationary esthetic and massage tables from Sierra Comfort, and they are an incredible deal! My favorite is the Adjustable 4-Section Stationary Massage Table. This beautiful table is constructed of beach hardwood and features adjustable four-section functionality, which allows for easy positioning of your client’s back and legs. The PU-leather high-density foam deck is oil- and waterproof and provides exceptional comfort. The height of the table easily adjusts from 27 to 36-inches to your desired working height to allow better technique when treating clients. Professionals find the built-in storage shelf convenient for storing all types of accessories. The ergonomic face cradle and pillow provided contours to the face spreading pressure evenly for a more relaxing experience. Adjustable Height: 29" - 36"
Check Out This GORGEOUS Spa Bed! Many times, Spa Beds look just like that....spa beds. Sometimes, however, we will come across a new Spa Bed that is like a breath of fresh air! The Rikka Multi-Purpose Spa Bed is just that! A natural wood finish covers a sturdy metal base, making this bed a gorgeous addition to any spa! The Rikka 3-Motor Electric Multi-Purpose Spa Bed is ideal for a multitude of body and face treatments. 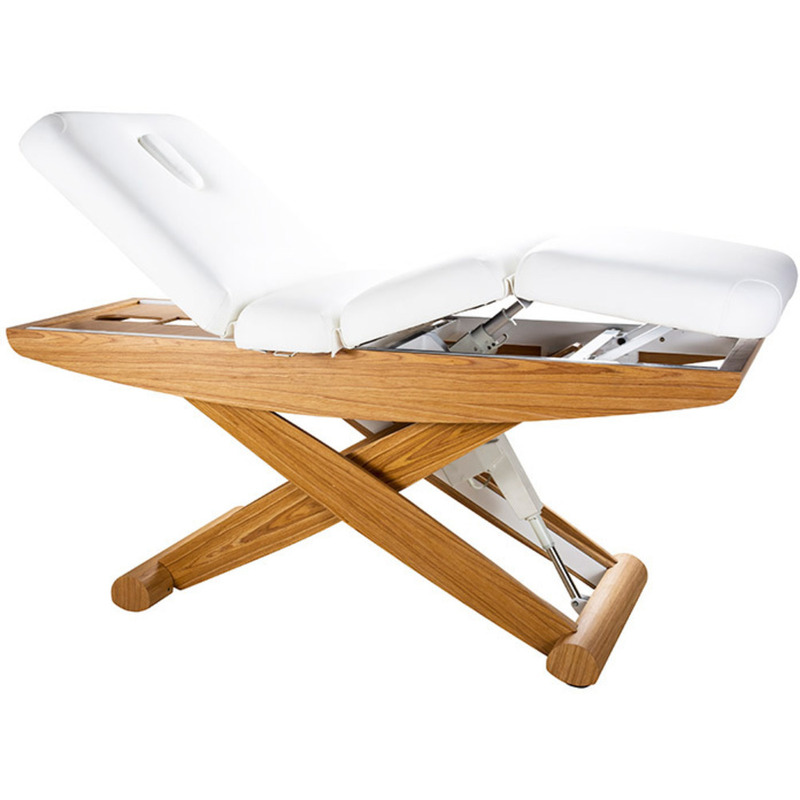 It features a comfortable and highly adjustable 4 section top as well as an attractive scissor-shaped metal base structure with natural wood finishing. It has 3 motors that effortlessly adjust the height, backrest, and the central module inclination via a remote control. Weight: 196.2 lbs. / 89 kg. Next to your own hands, what is your most important piece of equipment for your business? 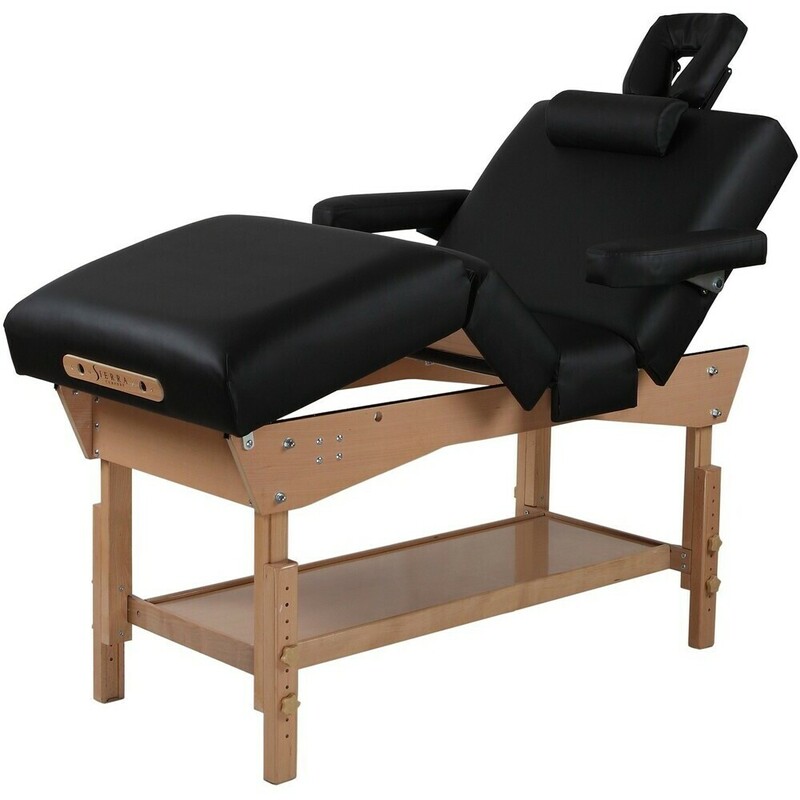 Most would easily reply your treatment table - it needs to be functional for you, and comfortable for your clients. 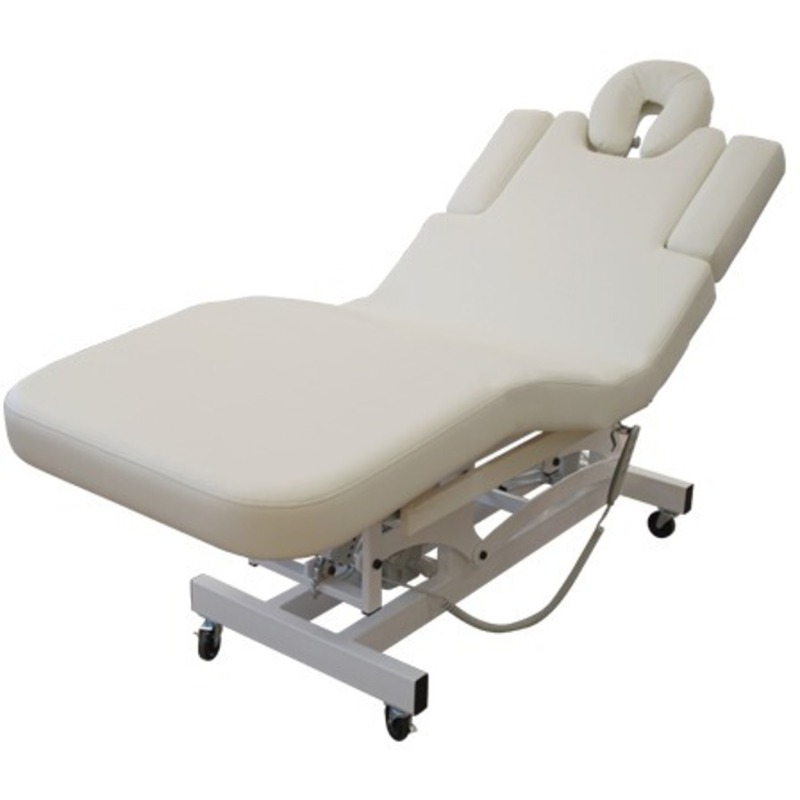 Silhouet-Tone has released the NEW Nevada Premium Treatment Tables, and they are AMAZING! Featuring a new Polylac base, the 4-column base is incredibly stable, making this table perfect for facial and body treatments, hair removal, massage, and more! There is storage space under the bed, which is ideal for holding your hot towel cabi, bed linens, or other products and supplies, and the foot pedal allows for quick and easy adjustments while maintaining client contact throughout your treatment. 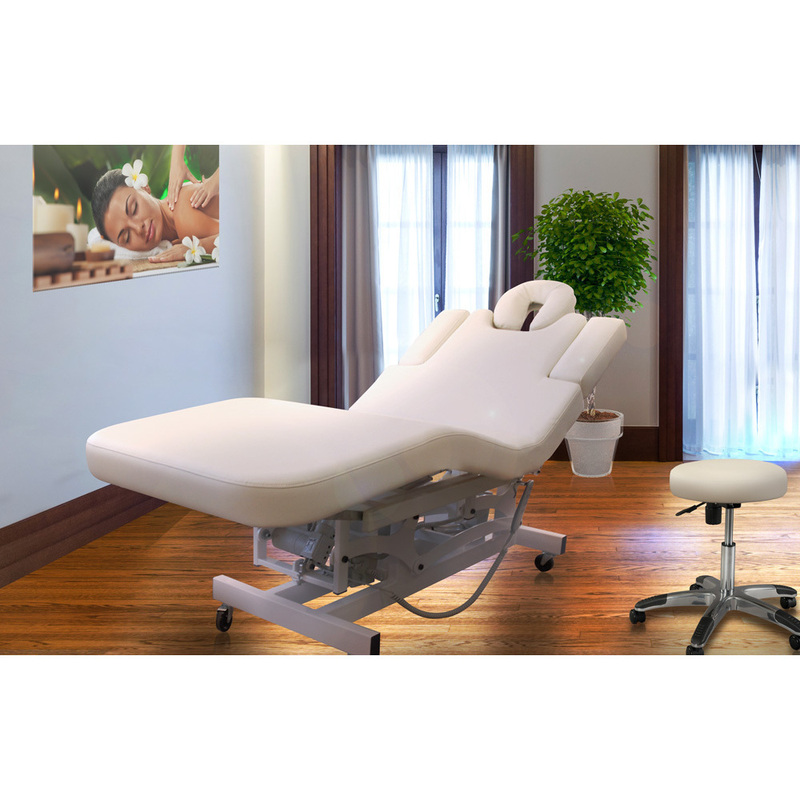 Don't forget, Pure Spa Direct also offers financing for furniture and equipment orders, so you can quickly and easily upgrade your treatment room while making low monthly payments! Day Spas, MedSpas, and Doctor's Offices, listen up! If you are interested in updating your chairs, or if you are opening a new location, we have the perfect chair for you! The Petra Treatment Chair is ideal for medical professionals and estheticians - the perfect choice for everything from injectibles to IPL to facials. The sleek single column design is both attractive and functional. The 4 smooth, quiet motors control the height, backrest, footrest, and seat inclination. 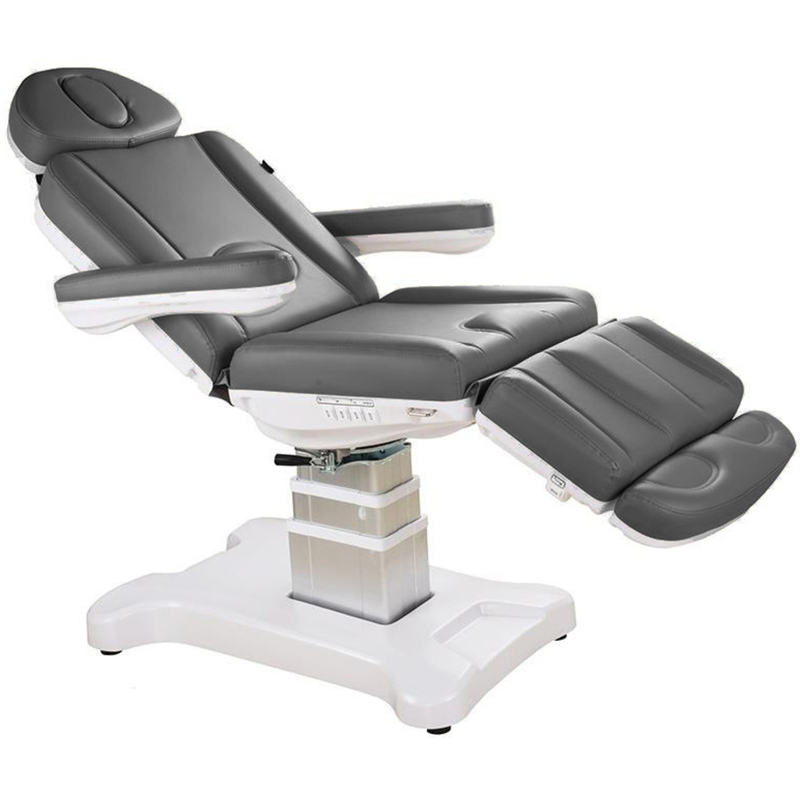 The Petra Treatment Chair can sit upright at a 90° angle with the leg section -90° (stright down) - which is the perfect position for getting up and close to your clients to perform injectibles! The Petra can also lay flat, making it perfect for multiple treatments. The armrests are reversible, and the headrest and footrest can be extended or removed. This chair also features an additional round headrest that can be interchanged. The Petra Treatment Chair is available in Gray, Sand and Black PU upholstery that is high quality and easy cleaning. A comfortable, high-quality, functional treatment chair can make all the difference to ensuring your clients are happy and your technicians are providing first-class, quality treatments! Why not step it up with the Petra Treatment Chair? This Bed Makes Me Dream of Surf and Sand! Are you a new spa looking at furniture, or an established spa, looking to upgrade your look? We just added the perfect new bed for you! The LAGUNA SAND SBF-1C by Silhouet-Tone is a highly versatile table beloved by clients for its outstanding comfort. Whatever the treatment, this table will fit seamlessly into your work environment. Thanks to its steel frame, this table will provide you the sturdiness you expect from your equipment. Furthermore, it can be used for a wide range of treatments including face treatments, thanks to its accessibility at the top of the table. The new armrests, which are now integrated, are incredibly easy to use and will make you wonder how you ever managed without them! What does the SBF in the name LAGUNA SAND SBF-1C mean? It is short for "Système de Bras Flexible" which is French for Flexible Arm System. What does the 1C mean? One cushion - the top of the table is 1 continuous cushion. *The Electric pedal for 3 motors does not come with the bed it is an option. If this isn't your perfect bed, don't fret! We have an enormous selection of spa beds from Silhouet-Tone, as well as many other manufacturers, to fit any budget! When preparing your spa room, arguably the most important piece of furniture is your spa bed. This is where your clients will spend their time when visiting you, and it needs to not only be functional for you, the technician, but also comfortable for your client. And not only comfortable - clients will come back if you have a noticeably comfortable bed! 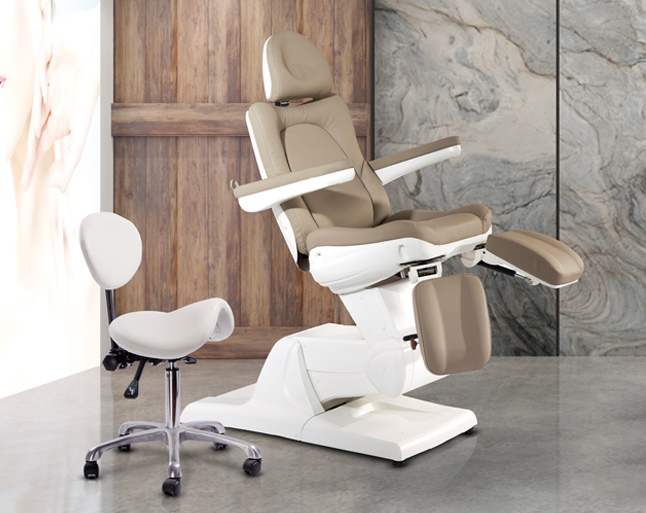 Pure Spa Direct has just picked up the all-new DIR Facial Beauty Bed & Chair Apollo - a high-end, Full Electrical Spa Chair with built-in Thermo Heat. This top-of-the-line bed is the bed your clients will come back for! 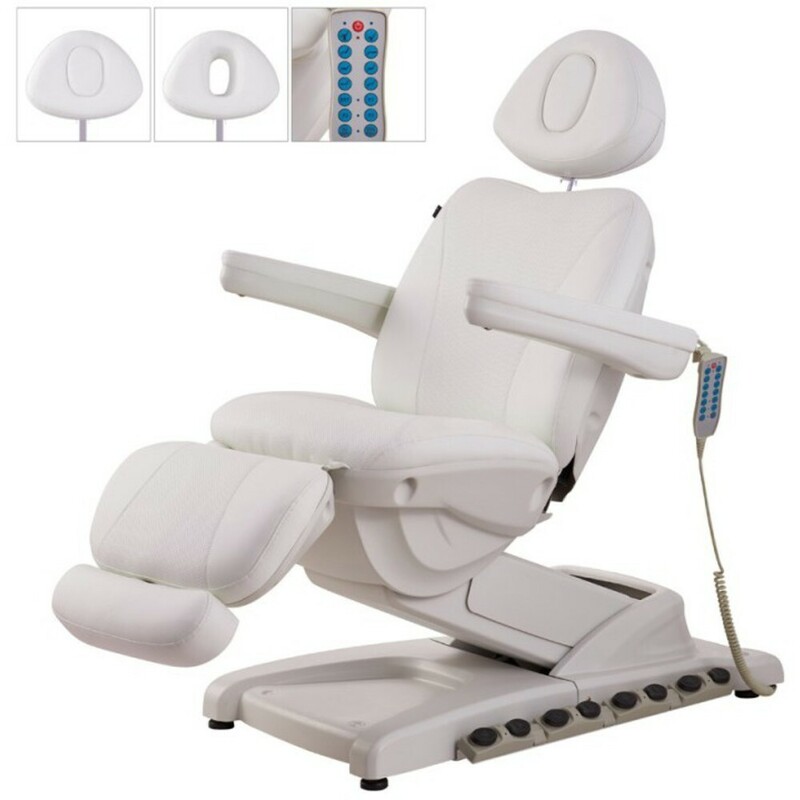 Experience our revolutionary full-electrical all-purpose beauty bed/chair Apollo, fitted with 4 electro-hydraulic motors controlled by hand or foot. This newly updated unit features thermo heat top, foot controls, finer adjustments, quieter operations and sleeker appearance fully integrated into a simple operating remote. I am LOVING this ultra-durable and super comfy bed by HANS. It's only $210, perfect for the spa buyer on a budget and needs a multi-function bed for facial and massage services. This model is called the Maarten, and it has been designed as a highly functional facial / massage bed with extremely thick and supple cushioning. Every spa treatment room could use more space, that is why I love the spacious rack beneath that provides ample storage for spa supplies and essentials. 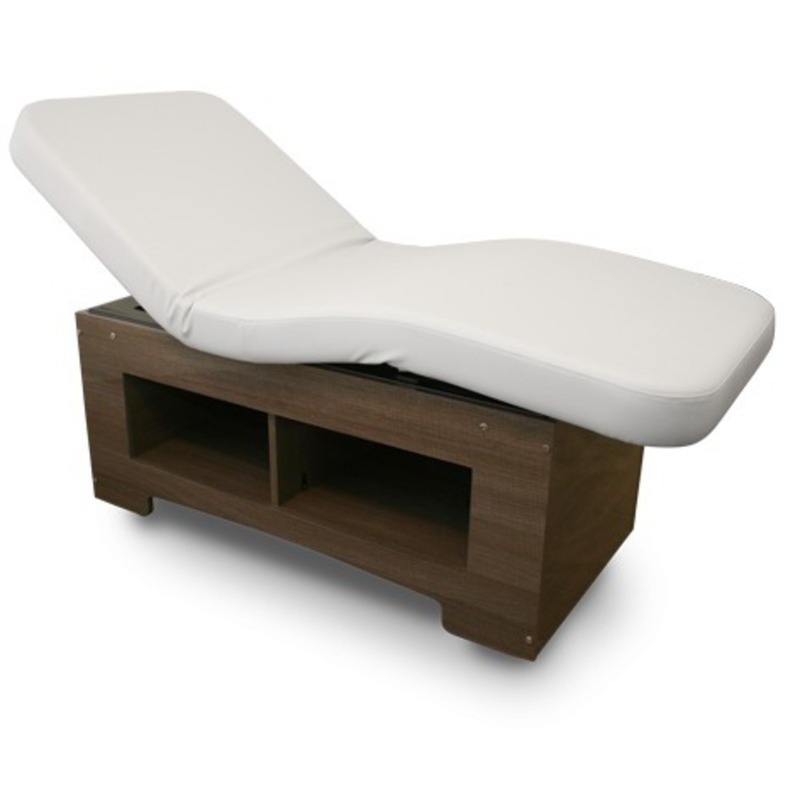 The removable pillow and face cutout allow for a massage bed conversion and easy positioning.